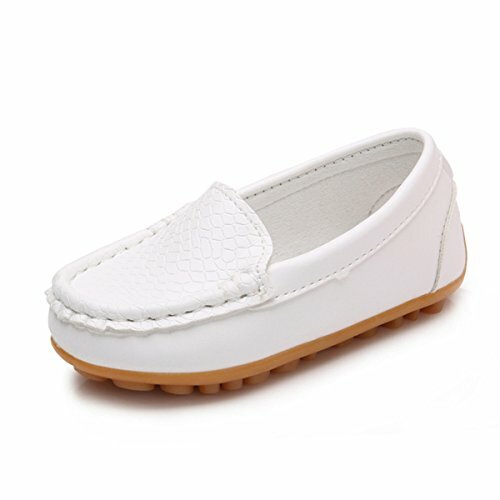 This leather loafers is lightweight and comfortable and soft. It can reduce the walking pressure when your children walking. This loafers has casual formal design, suits for child wedding shoes,baptism shoes, uniform shoes and casual formal wear. Flexible lightweight and soft- The loafers is so lightweight and the non-slip rubber sole is very flexible that it can make walking natural and comfortable. Durable stitch- The stitch and thick rubber sole is not easy to crack. It is durable for preschool and newly walking toddlers. Great for traction and slip on design- Easy slip on design and the non slip rubber sole is great for traction when children walking. Casual formal design- Formal and unique stylish makes your children more lovely and elegant in daily life. Suitable Occasions- Perfects for child wedding shoes, uniform shoes, baptism shoes, dancing dress shoes and even piano performance formal occasions. If you have any questions about this product by Timatego, contact us by completing and submitting the form below. If you are looking for a specif part number, please include it with your message.